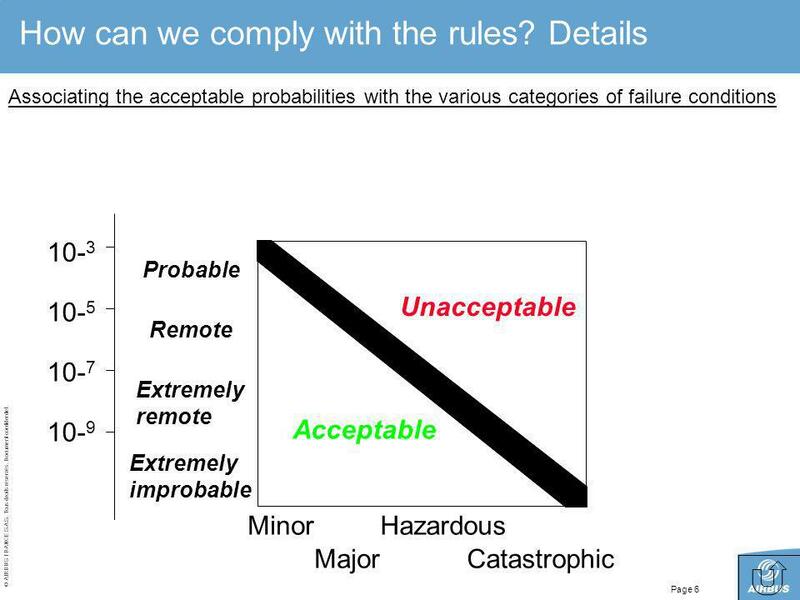 3 How can we comply with the rules? The logic. 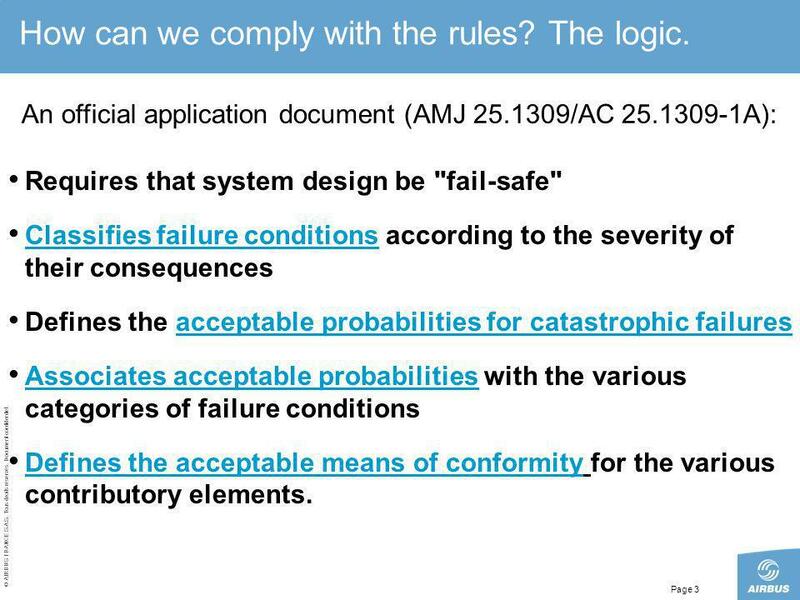 An official application document (AMJ /AC A): Requires that system design be "fail-safe" Classifies failure conditions according to the severity of their consequences Defines the acceptable probabilities for catastrophic failures Associates acceptable probabilities with the various categories of failure conditions Defines the acceptable means of conformity for the various contributory elements. 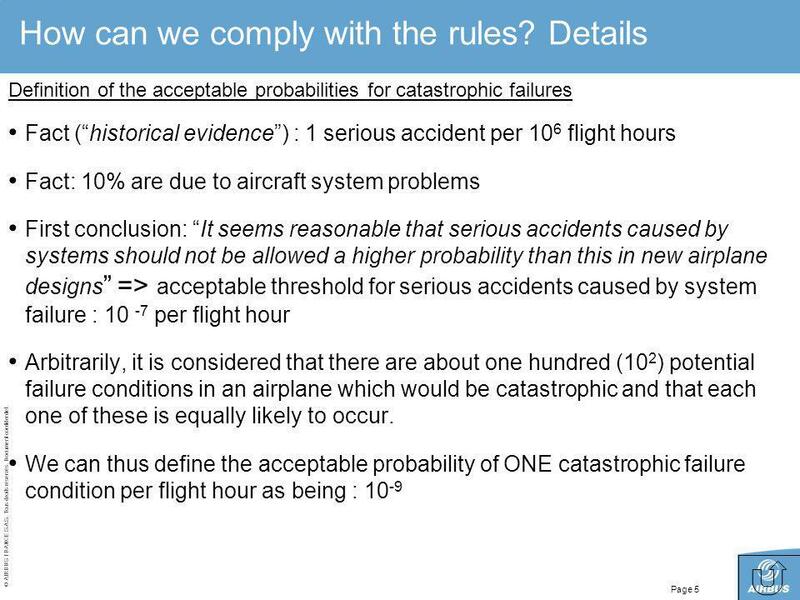 8 How can we comply with the rules? 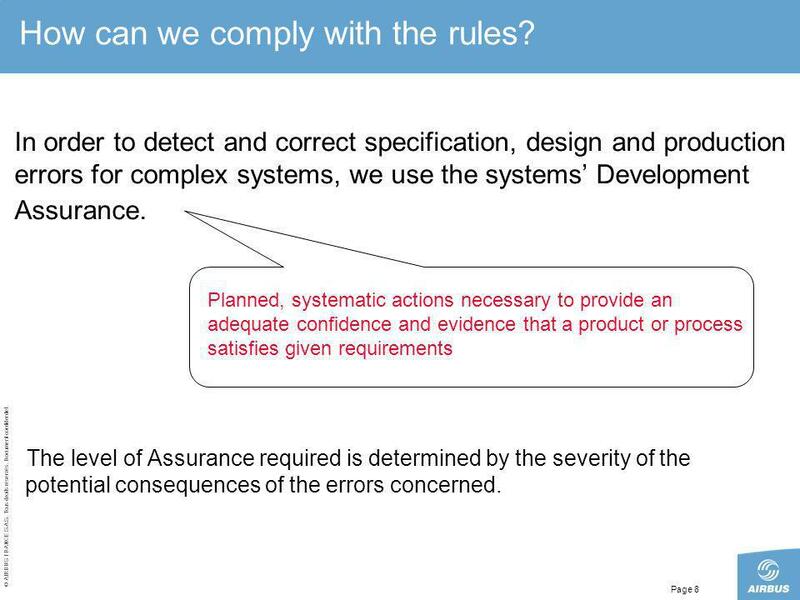 In order to detect and correct specification, design and production errors for complex systems, we use the systems’ Development Assurance. Planned, systematic actions necessary to provide an adequate confidence and evidence that a product or process satisfies given requirements The level of Assurance required is determined by the severity of the potential consequences of the errors concerned. 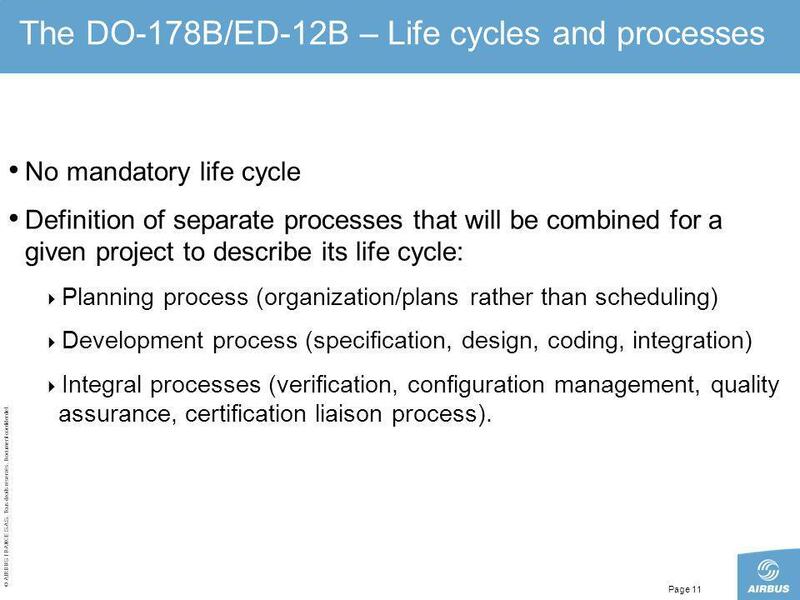 No mandatory life cycle Definition of separate processes that will be combined for a given project to describe its life cycle: Planning process (organization/plans rather than scheduling) Development process (specification, design, coding, integration) Integral processes (verification, configuration management, quality assurance, certification liaison process). 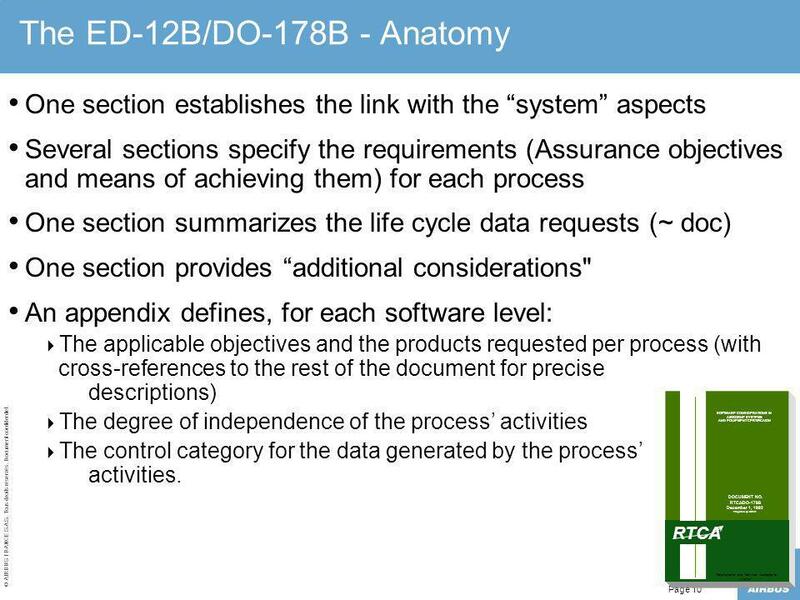 Define for each process: The Assurance objectives (e.g. : detect any errors introduced during development) The means of achieving those objectives (e.g : combination of reviews, analysis and tests) The process input data (e.g. 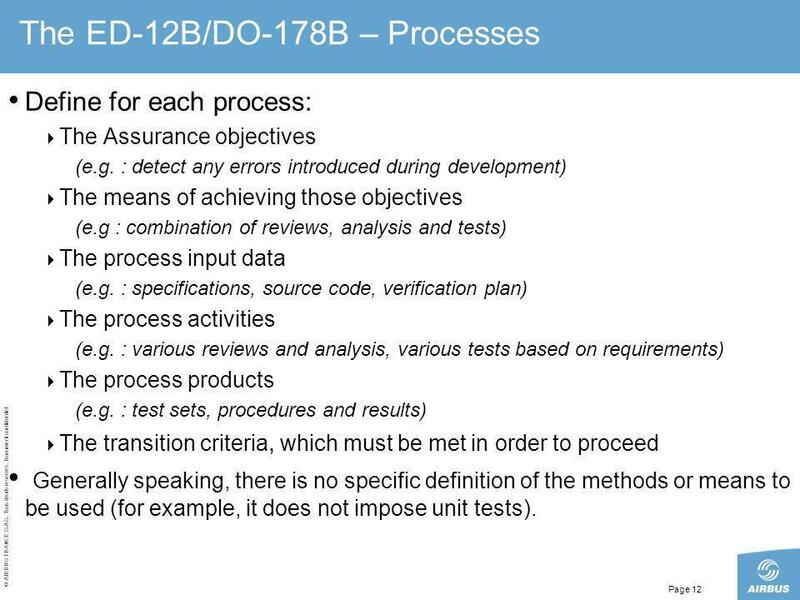 : specifications, source code, verification plan) The process activities (e.g. : various reviews and analysis, various tests based on requirements) The process products (e.g. : test sets, procedures and results) The transition criteria, which must be met in order to proceed Generally speaking, there is no specific definition of the methods or means to be used (for example, it does not impose unit tests). The largest section of the document in terms of volume: 13 pages of descriptions (the others contain an average of 5 pages) Work loads (and justification) generated.... 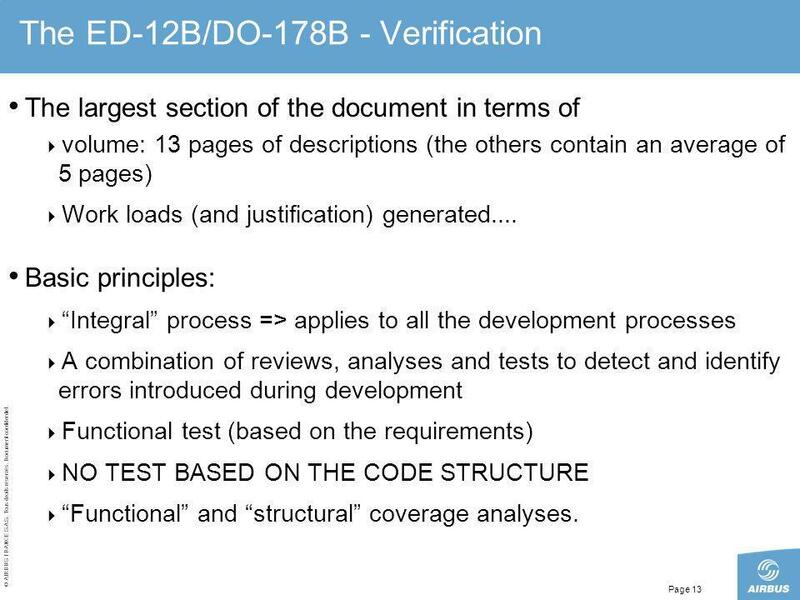 Basic principles: “Integral” process => applies to all the development processes A combination of reviews, analyses and tests to detect and identify errors introduced during development Functional test (based on the requirements) NO TEST BASED ON THE CODE STRUCTURE “Functional” and “structural” coverage analyses. 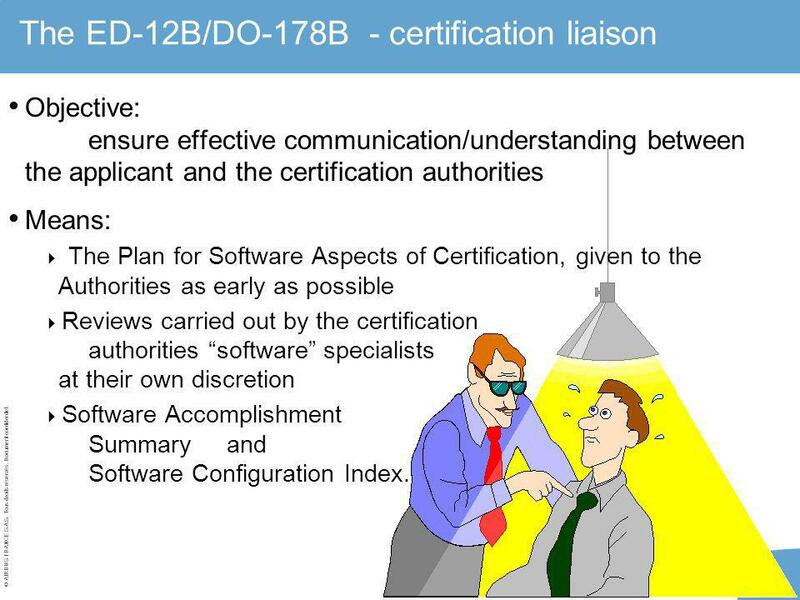 Objective: ensure effective communication/understanding between the applicant and the certification authorities Means: The Plan for Software Aspects of Certification, given to the Authorities as early as possible Reviews carried out by the certification authorities “software” specialists at their own discretion Software Accomplishment Summary and Software Configuration Index. 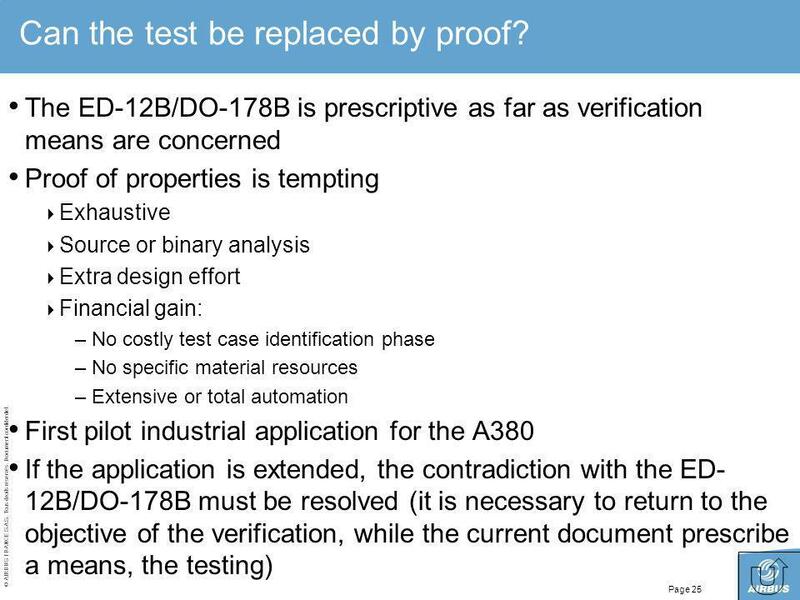 Necessary when processes required by the rest of the document are eliminated, reduced or automated by the use of a software tool (deterministic) whose outputs are not verified 2 categories of tools, defined according to the risk of error in the avionics code : Development tools (e.g. 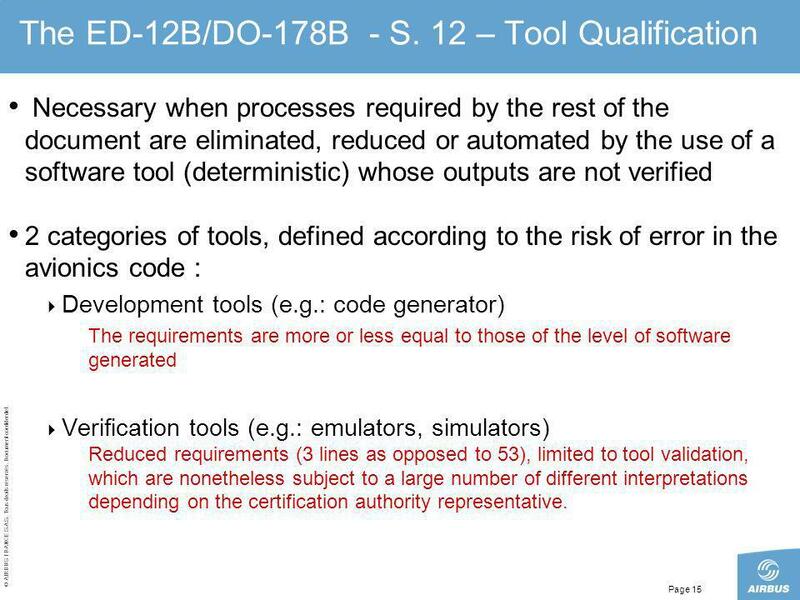 : code generator) Verification tools (e.g. : emulators, simulators) The requirements are more or less equal to those of the level of software generated Reduced requirements (3 lines as opposed to 53), limited to tool validation, which are nonetheless subject to a large number of different interpretations depending on the certification authority representative. Levels A and B are very similar They have the same number of objectives (except for one, concerning structural coverage) The main difference between them is the degree of independence required in the meeting of objectives (40 % with independence for level A, 20% for level B) Level C ~ 85 % of levels A/B (no. 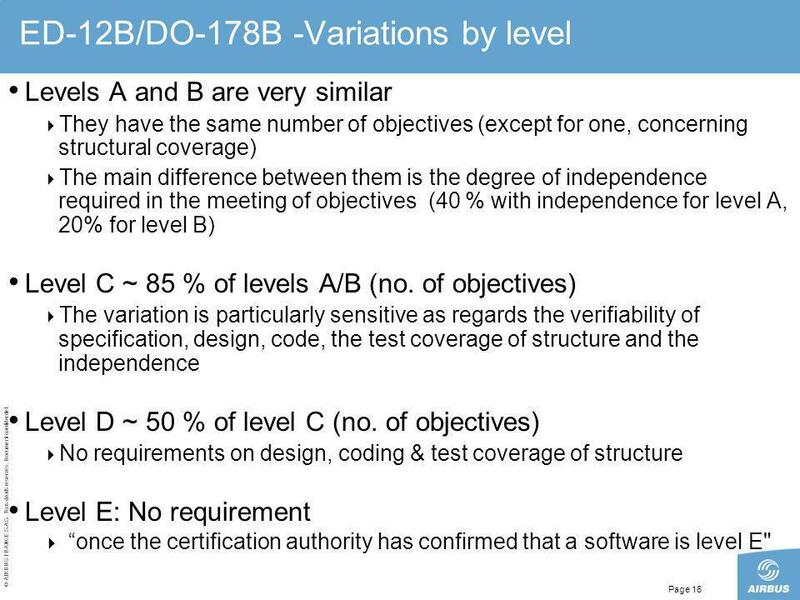 of objectives) The variation is particularly sensitive as regards the verifiability of specification, design, code, the test coverage of structure and the independence Level D ~ 50 % of level C (no. 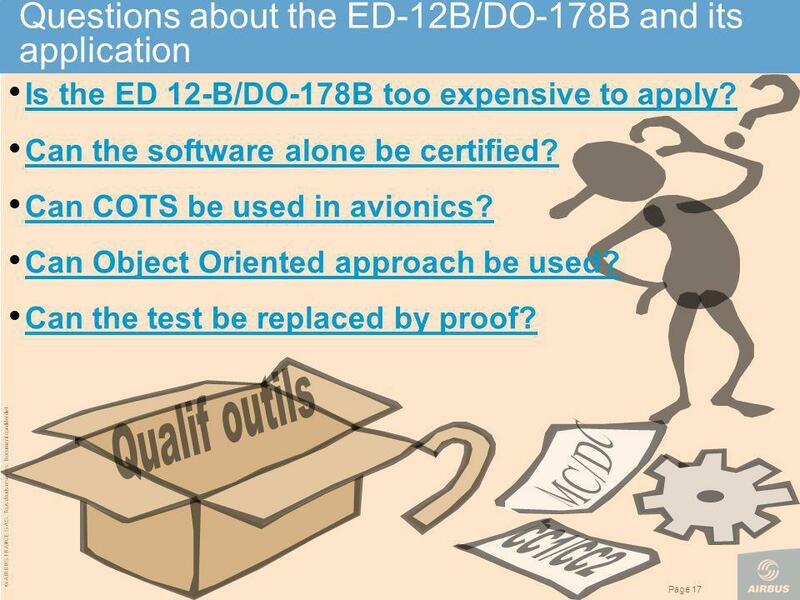 of objectives) No requirements on design, coding & test coverage of structure Level E: No requirement “once the certification authority has confirmed that a software is level E"
18 What about the future? 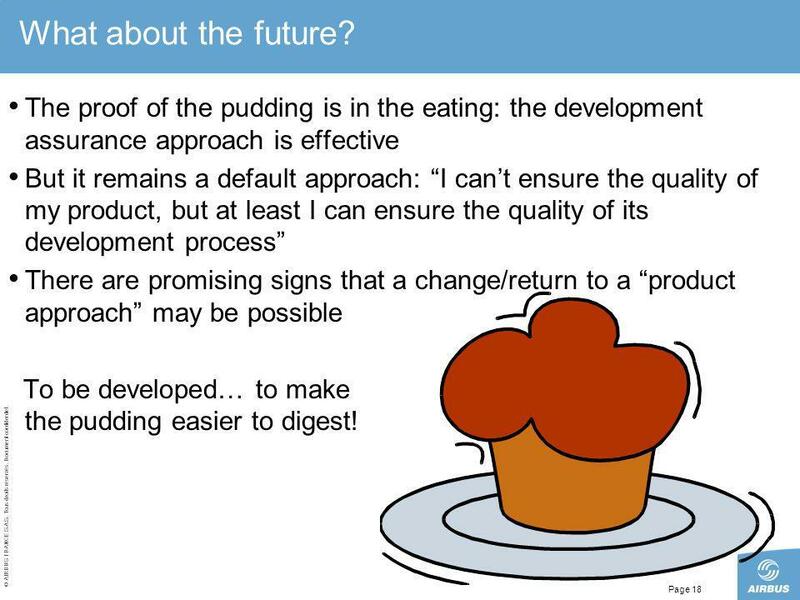 The proof of the pudding is in the eating: the development assurance approach is effective But it remains a default approach: “I can’t ensure the quality of my product, but at least I can ensure the quality of its development process” There are promising signs that a change/return to a “product approach” may be possible To be developed… to make the pudding easier to digest! 20 Is the ED 12-B/DO-178B too expensive to apply? 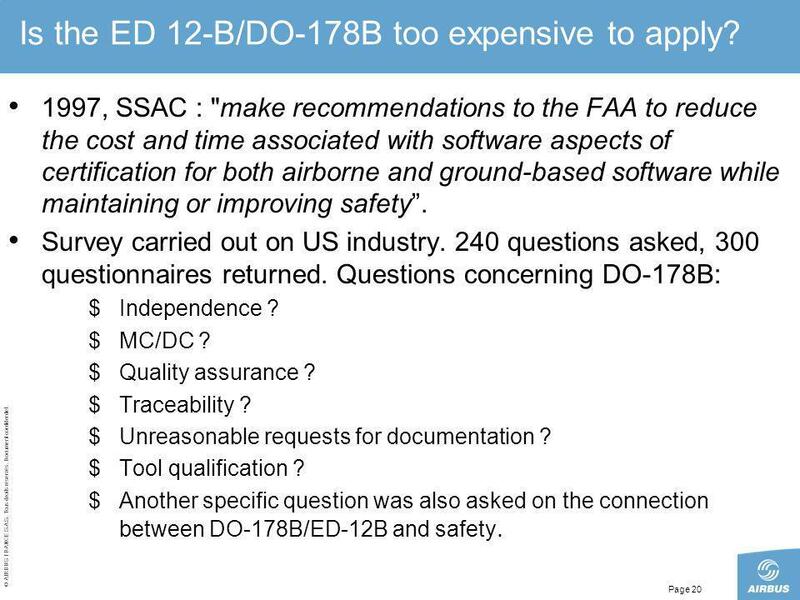 1997, SSAC : "make recommendations to the FAA to reduce the cost and time associated with software aspects of certification for both airborne and ground-based software while maintaining or improving safety”. Survey carried out on US industry. 240 questions asked, 300 questionnaires returned. 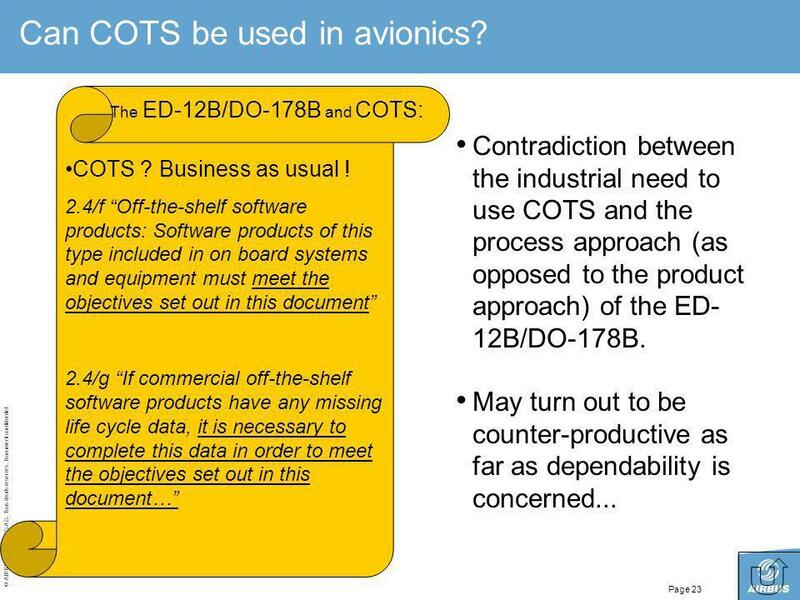 Questions concerning DO-178B: $ Independence ? $ MC/DC ? $ Quality assurance ? $ Traceability ? $ Unreasonable requests for documentation ? $ Tool qualification ? 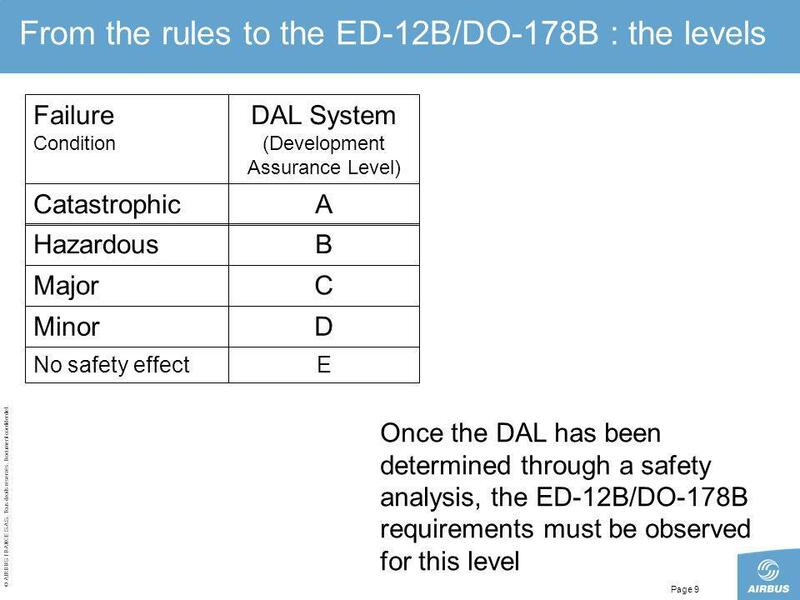 $ Another specific question was also asked on the connection between DO-178B/ED-12B and safety. 21 Is the ED 12-B/DO-178B too expensive to apply? But the answers received were rather surprising : Independence: 82 % think it is extremely or very valuable Traceability: considered effective, even if it is expensive Quality assurance: between 57% and 79% (depending on the question) think it is extremely or very valuable Tools qualification: everybody found some errors during qualification, which is less expensive than you might think Analysis of MC/DC structural coverage: 12% of industrials have never found an error with this technique, which is very expensive. 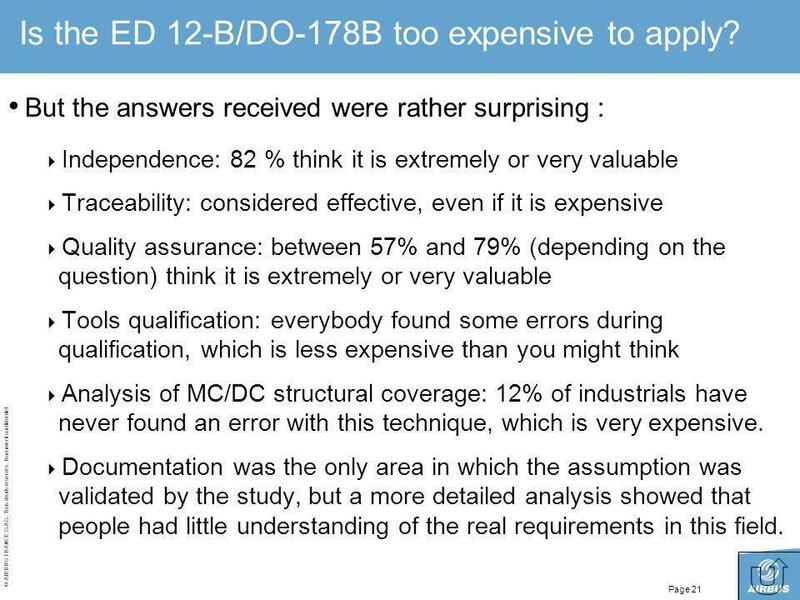 Documentation was the only area in which the assumption was validated by the study, but a more detailed analysis showed that people had little understanding of the real requirements in this field. 22 Can the software alone be certified? 1996. 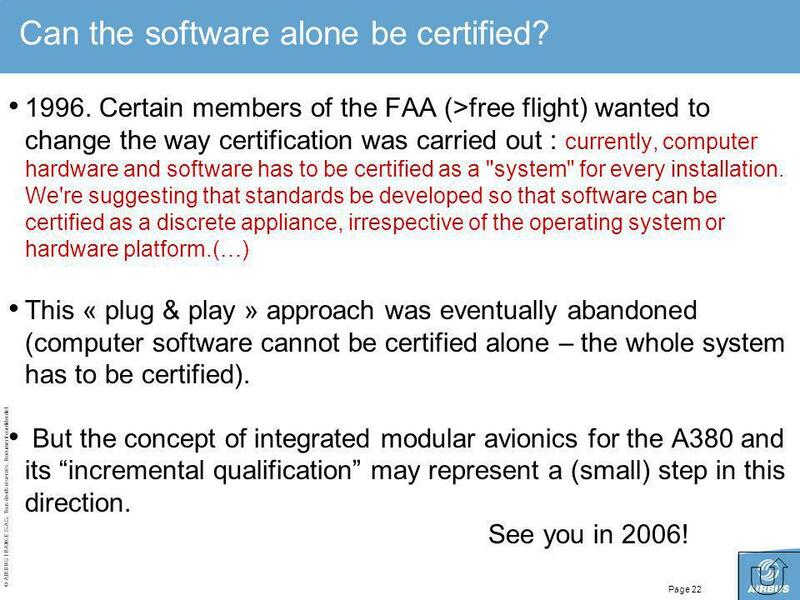 Certain members of the FAA (>free flight) wanted to change the way certification was carried out : currently, computer hardware and software has to be certified as a "system" for every installation. We're suggesting that standards be developed so that software can be certified as a discrete appliance, irrespective of the operating system or hardware platform. 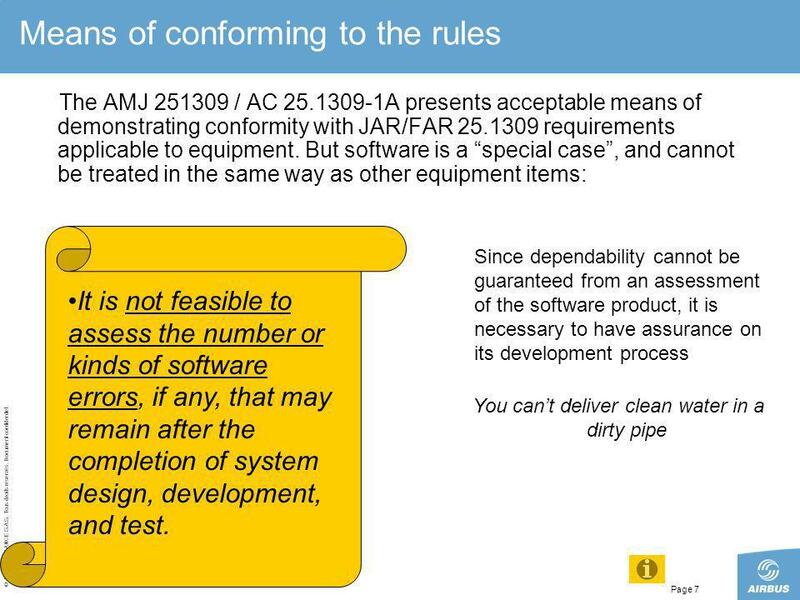 (…) This « plug & play » approach was eventually abandoned (computer software cannot be certified alone – the whole system has to be certified). 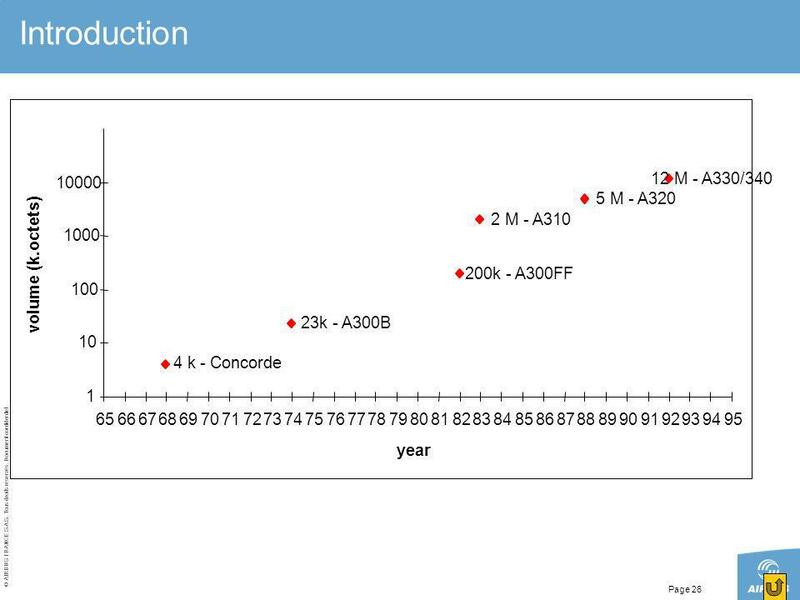 But the concept of integrated modular avionics for the A380 and its “incremental qualification” may represent a (small) step in this direction See you in 2006! 23 Can COTS be used in avionics? 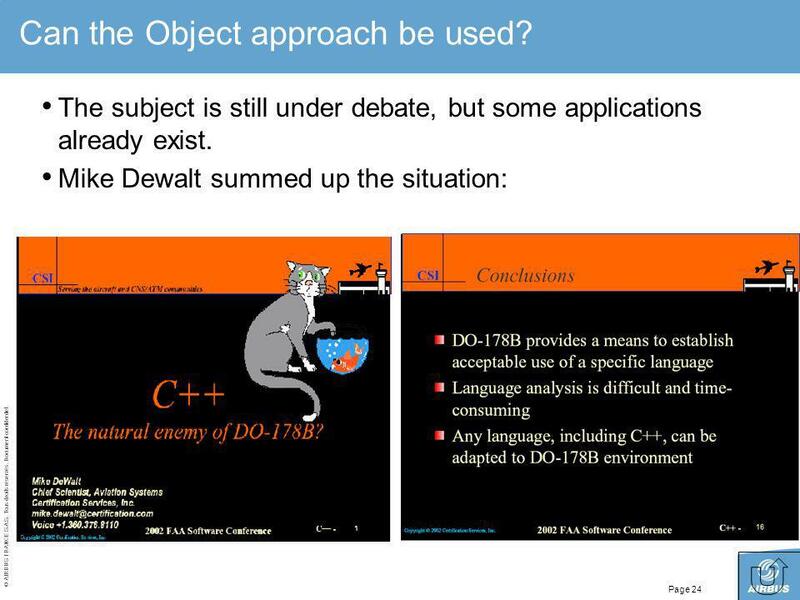 24 Can the Object approach be used? 25 Can the test be replaced by proof? 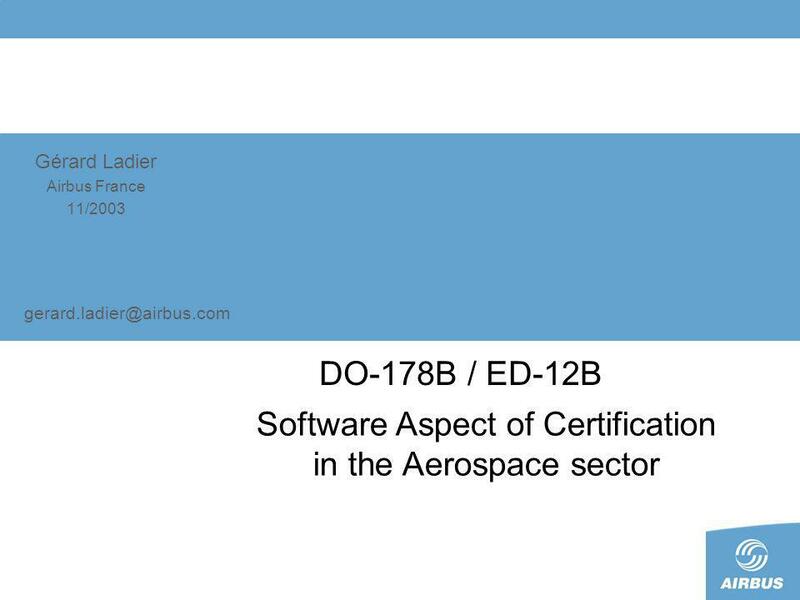 27 This document and all information contained herein is the sole property of AIRBUS S.A.S. 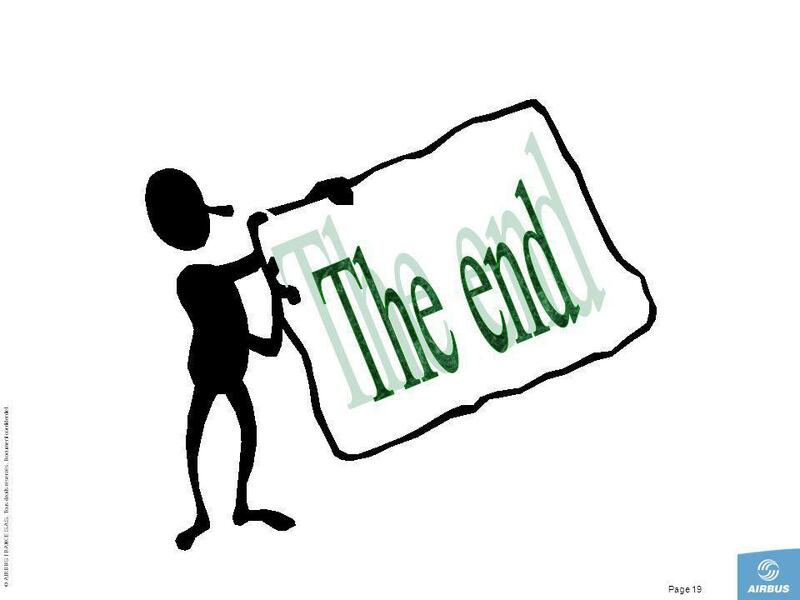 No intellectual property rights are granted by the delivery of this document or the disclosure of its content. 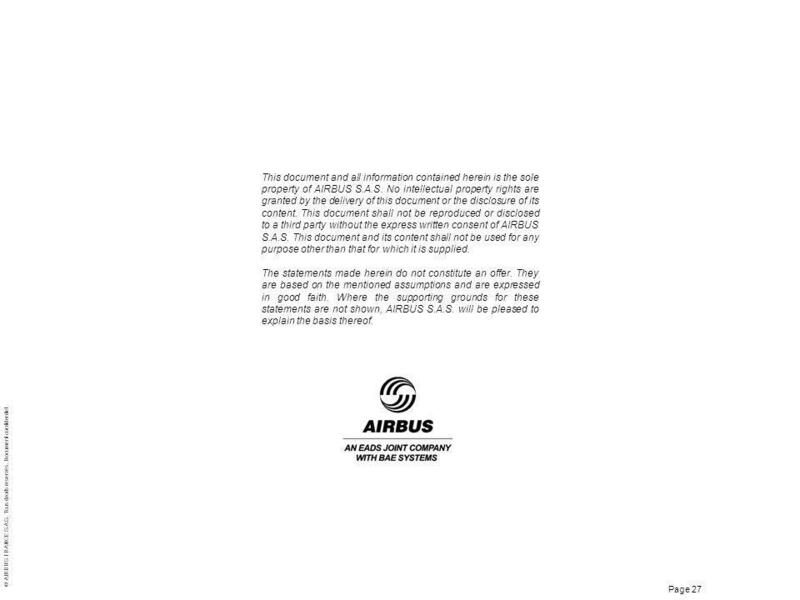 This document shall not be reproduced or disclosed to a third party without the express written consent of AIRBUS S.A.S. This document and its content shall not be used for any purpose other than that for which it is supplied. The statements made herein do not constitute an offer. They are based on the mentioned assumptions and are expressed in good faith. 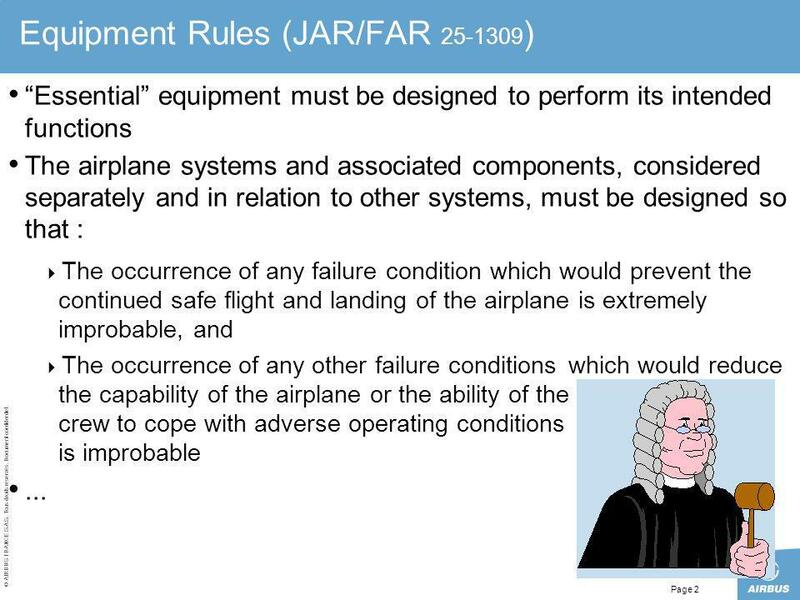 Where the supporting grounds for these statements are not shown, AIRBUS S.A.S. will be pleased to explain the basis thereof. 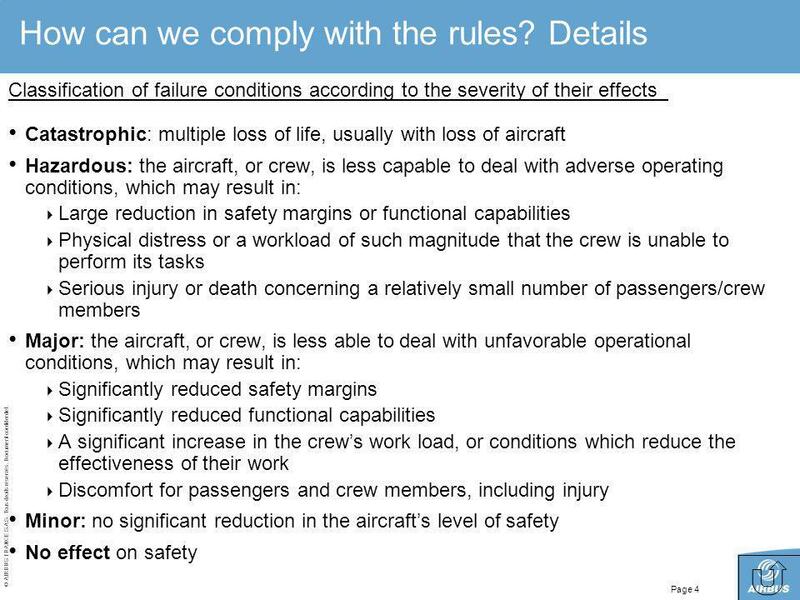 Download ppt "Gérard Ladier Airbus France 11/2003"
1 Introduction to Safety Management April Objective The objective of this presentation is to highlight some of the basic elements of Safety Management. 1 Documentation Legal Framework Air Navigation Orders Guidelines ATS Manual Airport Manual Safety Management Manual ICAO Annexes Licenses / Certificates. 1 Safety Assessment July SAFETY ASSESSMENT A Safety Assessment is essentially a process for finding answers to three fundamental questions: What. Integra Consult A/S Safety Assessment. Integra Consult A/S SAFETY ASSESSMENT Objective Objective –Demonstrate that an acceptable level of safety will. 1 Regulation. 2 Organisational separation 3 Functional Separation. The Safety Analysis Methodology EHEST Conference 13 October 2008 Cascais, Portugal. Harmonized implementation of CDM Accreditation CDM-Accreditation Panel. Feb 2009 Introducing ARTIST - Airbus Deutschland GmbH - TBCEI33 Introducing ARTIST Trust and Identification Aircraft Security Presented by Michel Messerschmidt.